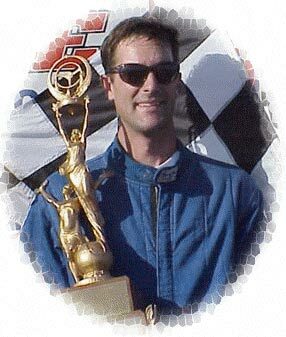 Dwight Wrich - a great husband, father, son, friend, and racing champion. Born into a racing family, Dwight followed in his famous racing father's footsteps and started racing regularly in the early 90's in the Pro Am class. Dwight quickly became competitive and soon thereafter moved up to the Late Model class. In the late 90's and into the 2000 season, he spent most of his time running in the Grand National Limited Late Model class, with frequent stops running with the full Late Models. Throughout his career, Dwight ran consistently at the front of the pack at several different tracks in Southeastern Nebraska and Southwestern Iowa, winning numerous A Features along the way. Dwight was always a contender in the season points race at every track he competed at, and won track championships at both Shelby County Speedway in Harlan, Iowa and Crawford County Speedway in Denison, Iowa. Dwight was a fierce competitor on the track and was driven to win every time he pulled onto the race track. His aggressive, hard-charging style of racing was a contrast to his laid back, easy going, friendly personality off the track. Many of his competitors would agree that meeting Dwight for the first time was like talking to an old friend. Dwight was a family man who enjoyed spending time with his wife Patty, daughter Morgan and son Carsten. He was also a successful businessman. During the week, he was the Vice President of the Investment Department of Wells Fargo Bank in downtown Millard, Nebraska. But come the weekend, Dwight was all racer! Arguably, the brightest star in this champion's crown was his achievement during this year's annual Tiny Lund Memorial at Shelby County Speedway. Dwight pulled off a dominant Grand National division victory in this prestigious event on September 17, 2000. Then tragedy, an all too real part of our sport, struck shortly thereafter, as Dwight was involved in a violent and fiery accident during the Hawkeye 100 event at Crawford County Speedway on September 30, succumbing to injuries the following day. Just two weeks after claiming the Tiny Lund trophy, the racing community lost one of its toughest competitors and all of us lost a true friend. All of our hearts go out to the Wrich family during this tragic time in their lives. May they know that we all share in their grief. In order to celebrate the life and career of this exceptional racer and individual, dirtdrivers.com would like to build this page into a scrapbook tribute to Dwight. To all of Dwight's fans and competitors, please email us at office@dirtdrivers.com with information about Dwight that you would like added to this page. We also need lots of photos! Email us jpg files or mail us prints to Dirt Drivers, LLC, 9100 Buckboard Drive, Lincoln, NE 68532, and we will add them to this page. Rest in peace, Dwight. And thanks for all the wonderful memories.... You are truly missed. In a special tribute to Dwight and the Wrich family, Rob Strabley, a fan of Dwight's, created two Late Model skins for the Dirt Track Racing game that are replicas of the 4v cars that Dwight raced during the 2000 season. Rob sent the files to dirtdrivers.com to be made available to all of Dwight's fans who have the game. I knew Dwight not real well but let me share just a little insight into who he was. I have been a race fan for a long time and knew that he worked at the bank in Millard. I saw Dwight talking with a client one day when I was doing some banking. So I went up to him said Hi and introduced myself. He knew me by family name since my parents had used him for financial matters. He asked how my dad was and just treated me like we had been old friends. Also when you saw him in the pits he always would take the time to sign an autograph with a smile on his face. I will miss Dwight's open style racing and last Sunday night at Sunset just didn't seem the same without him. One of the first memories I have of Dwight is back a few years ago when I first started racing in the Grand National division, before I even met him personally. One night at Sunset he and I ran an entire B Feature side by side. This was when he was running the white and blue #25x car. I think we took turns leading every other lap at the line, never getting more than a front fender ahead of the other. Unfortunately for me it was his turn to lead on the final lap! I remember pulling along side each other on the backstretch after the race was over and giving each other a very enthusiastic thumbs up! I know it was just a B Feature but that was some of the most fun racing I've ever done. "Freddie - Freddie the Pho-tawg-gra-pher !" I am sad to say that since we raced generally at different tracks I didn't get to know Dwight very well. But in only my second year in the grand national class I was very quick to find out who the fast guys are. At any track where the 4v pulled in we knew he'd be running up front and very hard to beat. He was a true competitor and I'm honored to have raced with him. Rest In Peace Dwight, and God be with your family and all your friends. Although we were not in the same class as Dwight, we knew who he was and that he had the same dream as every racer at the track. To do his best and hopfully go home a winner. As he proved to everyone the day he held the Tiny Lund trophy high with great pride and respect for the sport. Losing a part of our racing family takes a part of all of our hearts. Someone asked us if we thought about "hanging it up" after this accident. We think about it every day and our hearts go out to Dwight's family, but this makes us more aware and have more respect for the great sport we all love so much. We, as a racing team will go on to reach for that dream that Dwight achieved and so many others hope for. Our thoughts and prayers go out to Dwight's family and friends, and hope that we too, can fulfill the dream of being a great racer. Thank You, Dwight, for showing us all that if you work hard and not give up, you can achieve a dream. I aint got no memories of Dwight...but I have somthing else. I started racin in 1999 at 16 in the Hobby Stocks. I never really thought somthing like this could happen. I sat up in the stands during the Hawkeye 100 ready for a good race. I was wsatching over in turn 4 when out of the corner of my eye I seen it. I have been goin to races since I was 5 with my dad and I never thought about somthing like this. When I got a little older I realized somthing could happen in racing like this. Every time I se a wreck that requires the medics I always think the driver will be okay as I did at Dwights accident. I knew the car was on fire but I didnt know there was a human being inside of it. When the announcer said..."The driver is still inside the cockpit of this race car" I wanted to go out ther and help the officials when I knoew they were having problems with it. My buddies I went racin with said the look on my face was one words coulndt say...being a race car driver myself i watched IN FEAR! They said it was the worst look on my face they ever seen. After the accident they asked me if I was going to continue racing... twell ya the truth I didnt know at that point but now I know I am but I figured up about $1000.00 for just stuff I am going to wear...$2500.00 in other saftey. I didnt know Dwight at all I never even shook his hand before...that dont matter...we lost a part of the family i hate to say I LOVE more than my own! I encouage every driver as they allprobly know to do as much with there saftey equipment as possible.My thoughts and my prayers are ALL with Dwights family. Everytime we saw Dwight he was always one of the drivers that said hi and asked how we were doing. Dwight always made sure that you were happy and in a good mood if you were at the race track. He was a great guy and the jokes that he told us will always be kept sacred in our hearts. Thanks for all the memories, Dwight. Our friendship started out in the early 90's,when the 4v gang raced Shelby Co. speedway, Harlan Iowa. One night, the orange Camero drivin by W.Dwight Wrich won one of many features and he stepped out and gave his thanks to all his sponsors one by one he was so professional about it I said to my wife "I want to sponsor this guy" So we went down to the pits and later found out he was the son of Bill, my childhood idol in the 70's next week he added my small town tavern to there car and we have been friends ever since. We went from fans to sponsors to co-owners and back to fans the last 9 years in proAms,LateModels, Modifieds, Imca LateModels, Grand Nationals, all the way to Norfolk Neb to Burlington Iowa we watch Dwight race it was the best of times we ever had! Even though he was a busy man, he always had time to talk and always asked hows the family doing. One of the last things he said to me on our many many phone calls was I can't wait til we can tailgate at Kansas Speedway next year! We will miss him dearly!What a peach of a guy!! Our memories of our friend will be in our hearts forever! I wish I could have had a chance to thank Dwight for his special, hard charging ways of cleanly wining races. I never personaly met Dwight. He had a personal finance radio program every Sunday morning that I found very helpfull. I can still see his dad Bill driving the #55 Swanson Automotive Special back in the `60's at the Shelby County Highbanks. The was a 57 chvy that was hard to beat. Fast forward to Sept. 17, 2000, I see Bill hauling Dwight`s back-up car into the pits on the back of a faded blue Ford cab-over that Bill must have hauled his cars with 35 years ago. Bill drove the back-up car and finished a very respectable 7th while Dwight drove the 4v to victoy on a very dry-slick track. As Dwight was interveiwed he said "Dad builds them and I drive them. Thansks Dwight and the entire Wrich family for all the special memories. Dwight was my uncle. He started our hayrack ride that we have every year and this year it was delayed but we will get our hayrack ride and Morgan and I are going to make sure we have it. There are so many memories that I have had with him. The games on the hay bales. And the one and only time I got to be in the pits with him. I remember he was so happy to see me in the pits. I miss him so much!! But everyone keeps telling me to remember the good times and I'm trying. I loved Dwight and I still love him very much. Dwight was a real hard racer. He was good behind the wheel. He was always winning features and always had a really good car. I have been a fan of Dwight for about 1 year now I never did get to meet him but wanted to real bad. He was always cool and never gave anyone or anything trouble. So to all of you Dwight fans we will miss Dwight so much in the racing season and throughout the racing history he wont ever be forgotten. Dwight is greatly missed by his family! He was the thread that kept us together! I hope that anyone that ever had the pleasure of meeting him-can and will think of his unique way to speak only good words of everyone! For all you driver's that will crawl into your race cars as of April-Say a prayer! His number came up way to soon and we never know when ours will! We all will keep Dwight's sense of humor with us -he always had a nickname for anyone! When the 2001 racing season begins I can't imagine the emptiness we will feel! Now is the time he would push me to help him get sponcerships! As for anyone that ever helped us/him with our "career" thank-you! You'll never know how much it has meant!We have got great memories-Don't ever forget the Tiny Lund 2000-after the checkered flag!! Backwards over turn 1!? !And what a goal to reach has one of your finally ones! !I think daily of him reaching his ultimate goal of racing with "The Big Boys!" Don't kid yourself him and The OZ are right there with Davie, Alan and the rest!! !Watch over us Bub! Missing you as we end the year 2000! I didnt get to know Dwight real good on a friendly basis but when Deinson opened up the track way back when it was fun to race my ole chevelle against his and the rest of the camaros. I still remember his crew asking me, "How do you get that thing to go around the track?" Im not sure how they meant it but it didnt matter cuz we were there to race and we did. My thoughts and prayers go out to the Wrich family. May Dwight race in peace. Would also like to say hi to Rich, havent seen pr talked to him in a long time. THANKS. GOD be with all of you! Dwight was a SPECIAL kid, he loved racing, as he grew up with it, his father raced every week end and it was a family thing to do. In the younger years Mom dressed the kids all up in white pants and blue shirts to match the car that daddy was driving. He so enjoyed racing as it was a relaxation for him from the every day stress of work. He always strived to do his very best, he was almost a perfectionist in everything he did. It was a terrible tragedy and we still wonder WHY? He had everything going for him, he was loved by so many people, as he loved every one that his life touched. He is missed terribly and racing will not be the same for us. We love you Dwight!!!! I never knew Dwight I was just at the Hawkeye 100 the night of the accident! I was just ready for a good night of racing and to my surprise it ended in a tragedy! I know deep in my heart that Dwight will be missed very much by a lot of people! I love racing and I watch over everyone that I know that does race and I keep them in my prayers too. May all Prayers be with Dwights family! Racing will never be the same! We used to watch him race on the television when it was on. We're sorry to hear about his death. He was a good racer on television. please lookoy for all of us. I watched Dwight race for quite a few years at Sunset, Denison and Harlan and probably other places too that my dad was racing at. My grandpa raced with Wild Bill back in those days and has told me a lot about Dwight and his dad. I was there at Harlan when Dwight won the Tiny Lund and I thought that his style and driving that day was awesome and that Bill got to be in that race also. Our thoughts and prayers are with Dwight's family. Words alone can't describe how much I enjoyed going to the races all these years to watch my uncle Bill and then my cousin Dwight. They were both great drivers and sportsmen. It has been difficult to go to the races this year because it just isn't the same. I know they are watching over all of the other drivers and doing their best to keep them all safe. Dwight has left me with many great memories of a sport that I adore so much. Dwight would always tell me be patient, some day you will put it all together and be out here too. Dwight and Uncle Bill have been my race idols all my life. Someday I will be out there and hope that I can have and positive influence on the sport as he and Bill have. Patty, you and the kids are always in my prayers. Uncle Bill and Aunt Joyce we will miss him but never forget him. 4v forever!!!!!! I and my wife was members of the pit crew when Dwight was driving Ken Swanson's modified #55. It was and still is a thought of great pleasure having been part of Dwights racing career. Our conversations before and in between the racing was always so relaxed and very little about the races, the car or track. We talked about our families and subjects of everyday life. When Dwight climbed into the car, it became business of racing. It took a great man to be able to separate the two at a fast pace of events. I have this page bookmarked and frequently read and reread many of the comments and I personally thank all of you for your thoughts, prayers and entertaining stories you have shared for our family. I know you are watching over us Dwight as a bright, shining heavenly angel. This could not have been more evident this past New Year's Eve when Patty, your children and I were involved in an auto accident caused by an intoxicated driver. Fortunately, no one was seriously injured and we are recovering. We will never recover from the loss of your precious life Dwight, but I know you were with us that night. The car we were in was a total loss, but Dwight you once again watched out for me and more importantly, your family. I could discuss many, many stories as children growing up or racing stories every weekend cheering for Dad with entire family traveling througout the Midwest. As adults, perhaps one of the most fulfilling aspects of our lives were our telephone conversatons talking about our families. Sharing stories about our children and wives and the love for each and everyone of them. These conversations we enjoyed througout the years, even though we were miles apart, will be with me forever. Everyone that has contributed to this memorial website knows you were a great racer, but you were also a wonderful son, father, brother, uncle, friend, confidant, cousin, teammate..the list goes on and on. You are thought of daily Dwight and my daughters, as young as they may be, will always know who their Uncle Dwight was. You are dearly missed Dwight and until we meet again, reserve a seat for me in the main grandstands because I know you are on the pole position. Thank you for watching over your family and myself this past December 31st. Even though it has been over a year since Dwight left this life on earth, his presence will be felt and known for a lifetime, which includes generation after generation. I am just starting to race in the Modified division in Pennsylvania. Anytime a racer is lost, this world is missing a person who is an individual and someone special by far more than anyone can imagine. Sorry for your loss. He was a very clean and nice driver when it came to driving with others.